Youth Week WA is back for 2018! 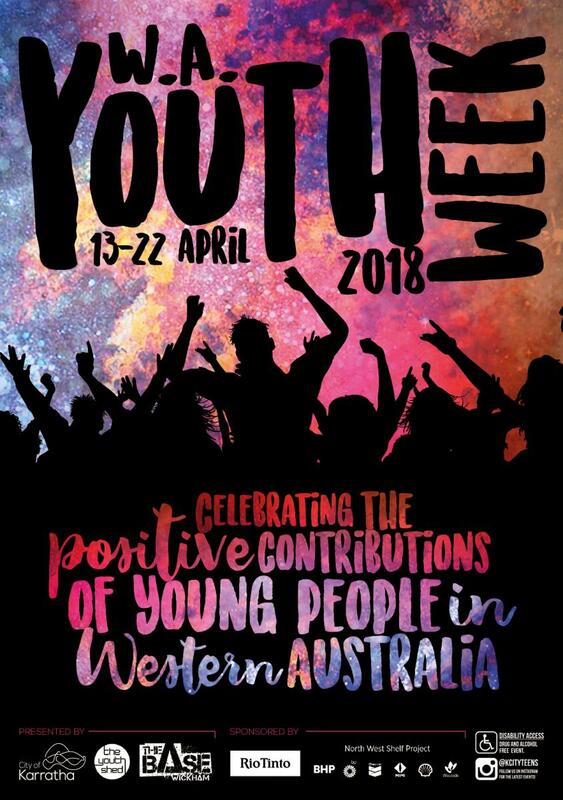 Youth Week is an annual celebration of the positive contributions of youth people to Western Australia and you’re invited to celebrate with us! Colour Fest Get covered head to toe in coloured powder while laughing, dancing and leaping your way through a series of epic obstacles at Colour Fest! Cattrall Park, Karratha Fri 13 April, 4-7pm 11-18 years only FREE Shuttle bus available from The Base, Wickham. Registration required. Illuminate the Night Street Party Join us for an epic outdoor street party! There will be inflatable fun, food, entertainment and more! PCYC, Roebourne Thurs 19 Apil, 4-8pm All ages, community friendly event FREE Shuttle bus available for 11-18 years from The Base, Wickham and The Youth Shed, Karratha. Registration required. Block Party Celebrate the end of Youth Week WA 2018 with a massive street party! There will be entertainment, fun, food and more! 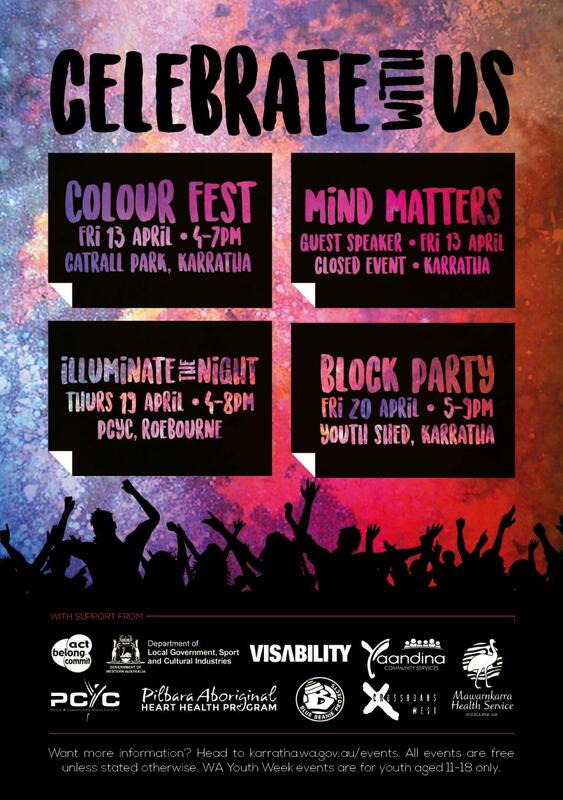 The Youth Shed, Karratha Fri 20 April, 5-9pm 11-18 years only FREE Shuttle bus available from The Base, Wickham. Registration required. To register for the shuttle bus please contact Youth Officer, Tamara Leacy on: tamara.leacy@karratha.wa.gov.au or 0457 804 189. Please note, the shuttle bus is only available to youth aged 11-18 years. Youth Week WA 2018 is proudly presented by the City of Karratha, The Youth Shed and the Base, sponsored by Rio Tinto, the North West Shelf Project and supported by Act Belong Commit, The Depeatrment of Local Government Sports and Cultural Industries, Visability, Yaandina Community Servides, Mawarnkarra Health Service, Crossroads West, Pilbara Aboriginal Heart Program and PCYC Roebourne.